Daughter turning 14? This is when to start planning a Quinceañera! Hispanics know this tradition but others may not. This is a Hispanic tradition celebrating a girl’s coming of age, which is her 15th birthday. The tradition revels in the girl's voyage from childhood to maturity and focuses on family, God, friends, food, music and dance. 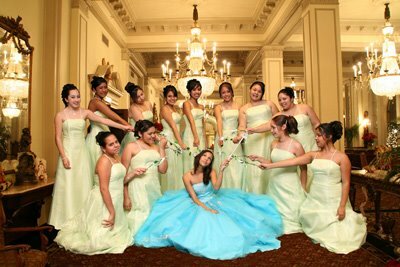 A Quinceañera is an important and elaborate affair for many families. It is important to begin planning with plenty of time - 6 months at the very least - in order to select a theme and purchase the Quinceañera decor, supplies and the formal party dress. The celebration usually starts with a religious ceremony. A part of the church ceremony involves a kneeling pillow, which is often personalized with the girl's name. The girl kneels on the pillow during the service. When the Mass of Thanksgiving is included in the service, gifts are given to the priest to receive a special blessing. Padrinos, who are sponsors or godparents chosen by the family, then give the gifts to the honoree. Another aspect of the ceremony is the 'last doll.' This is the final doll the girl will ever own. She passes the doll on to a younger silbing. Sometimes capias or printed ribbons bearing the honoree's name and the date of the ceremony are pinned to the doll. The celebrant gives guests a capia souvenir from the doll. The honoree is presented with a cross or medal; a tiara, a scepter and a bible or prayer book and a rosary. The cross or medal represents faith in God, in the world and in herself. The tiara represents a princess before God and the world as well as a conquest over childhood and the capacity to face the challenges that lie ahead. The tiara replaces the ceremonial headpiece the girl is wearing. The 'crowning' is done by her parents or godparents. The crowning usually takes place during the reception. The bible or prayer book and the rosary are essential resources the young woman needs to keep the word of God in her life. The scepter represents authority and responsibility for her life. One of the main traditions is the changing of the shoes, which signifies the girl has grown up. She changes from flats to high heels with the assistance of her father or a male relative. The girl's best friends and family members take part in the event. They are called the Court of Honor. When the court is made up of girls, it is called Dama; when it's all young men, it's called Chambelan or Escorte or Galan. This is a very dressy affair. The honoree wears a ball gown as do the members of her court. Males wear tuxedos. When to start planning a Quinceanera? Obviously, parents know when their child is turning 15. Start planning for the occasion between six and 12 months in advance of her 15th birthday. Plan a budget, pick a theme and venue, discuss location, food and entertainment. Contact the church about the Mass ceremony and get in touch with a Quinceanera salon in regard to the actual party. Some churches require a person to be a member for a minimum of six months before allowing this type of ceremony to take place. The salons are also busy so don't wait until the last minute to make contact. God parents (contributing sponsors) must be selected well in advance. Decide how many guests will be invited. You will want pictures so find a reliable and professional photographer. Ask to his see his work before signing on the dotted line. Pick out invitations, choose a caterer and select your dress. Choose who will be in your court (seven couples are recommended) and pick a bakery to create your cake. This is comparable to planning a wedding. It's a big event. There is a lot of work to be done and important decisions to be made so start seriously thinking about the event shortly after the girl turns 14. This will give you plenty of time to plan and prepare for this wonderful occasion.